Feral goats were introduced to Australia in 1788, and now occur across approximately 28 per cent of Australia. They can be found in all states and territories and on some offshore islands. 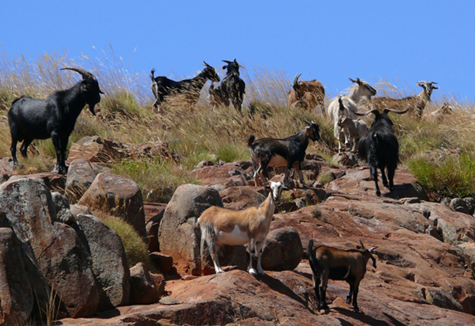 Impact: The feral goat has established populations in a variety of habitats. It competes with native fauna and causes land degradation, threatening plant and animal species and ecological communities. Feral goats have a major effect on native vegetation through soil damage and overgrazing of native herbs, grasses, shrubs and trees. This grazing can cause erosion and prevent regeneration. They foul waterholes and can introduce weeds through seeds carried in their dung. Feral goats carry footrot, and can infect or reinfect sheep through their contact with sheep. They could also carry exotic diseases such as foot-and-mouth disease.